Estate agent on George Street. It moved here from 83-85 High Street around the end of December 2018/start of January 2019. It was previously a branch of the Yorkshire Building Society photo, but this moved down the road to 66-68 George Street in September 2016 photo of poster. The premises were still vacant as of October 2016 photo, January 2017, March 2017, October 2017, February 2018, June 2018, and October 2018. 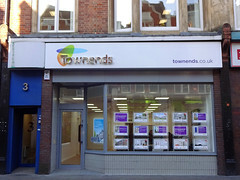 As of December 2018 there was a sign up stating that a branch of Townends estate agents would be opening on 2 January 2019 photo; this still hadn't happened as of 4 January, but by 22 January it was definitely open. Last edited 2019-01-22 18:09:18 (version 34; diff). List all versions. Page last edited 2019-01-22 18:09:18 (version 34).